The first wave begins at 8am and the event ends around noon, depending on event capacity some locations will have waves that go later into the day. 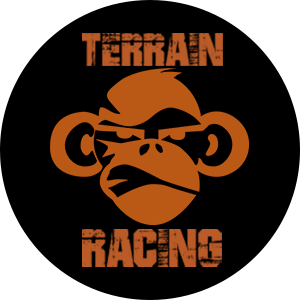 Terrain Racing Terrain Racing challenges you both physically and mentally with over 20 obstacles! Choose a 5k or 10k option, and after your race party at the finish line with friends, family, mud and views of the obstacles you just conquered! You’ll be proud when you finish your race with us. You’ll sweat. You’ll get dirty. You and your friends will have the time of your life.Make terrain Your race, Conquer Your Terrain!Kid's races vary in distance and age categories from location to location, so be sure to check our website for more information on Terrain Mud Runs for the whole family! Average rating: 2.62 / 5 from 109 reviews. Want to race more than once? For an extra $15 you can run as many laps as you want. This is great if you want to race the Competitive wave and then again with family or friends new to mud runs. You'll get a special wrist sweatband and each lap you complete you'll collect a monkey pin so you can brag after the race. Non-refundable, fully transferable...Instead of offering a refund we allow you to transfer your entry to another person or a future race. Terrain Racing challenges you both physically and mentally with over 20 obstacles. Come out and conquer your terrain with your friends and family and receive a finisher Monkey MEDAL! Our races are based around a 5k structure, so you can generally expect about 3 miles of mud, walls, ropes, monkey bars, and 20+ other examples of anything we're able to fit into the unique terrain of each venue we visit. We're consistently striving for innovation and excitement in our obstacles, so there's always a chance you'll see something brand new! From the moment you step off of that start line, until you triumphantly cross the finish, we hope you're prepared to have the time of your life among so many of your new best friends in the Terrain community. If you're looking for some killer endurance training, then you can pay for the Unlimted Laps and run laps all day long! Each time you cross the finish, you'll get plenty of high fives and congratulations, in addition to a special multi-lap pin. By the end of the day, you can put all of those pins on your medal's ribbon and proudly strut through the festival area, enjoying some delicious food and a cold beer while thinking of the immensity of the accomplishment you conquered that day. Every event will have aid stations along the course with water only. You may need to bring your own energy gels and food, but water will be available every 1-2 miles on the course. The fastest elite female and male athletes in the 5k and 10k distances will be awarded: 1st place - $200, 2nd place - $100, 3rd - $50. We use chip timing if you’re in competitive waves: 8:00a, 8:05a. This lets you see how fast you really are and we provide you with a free printable ‘finisher certificate’ online after the race. If you want to be eligible for an award, sign up for the Competitive Waves. You must complete all obstacles to be in the results and available for prizes. Free! We create a finish area that includes many exciting obstacles for spectators to watch their family and friends on. There is no charge for spectators at our events and we encourage you to get a cold beverage, grab a bite to eat and hang out! Parking will be $15 - $25 depending on different venues. Make sure and carpool so you can save a little money! Proceeds from Terrain Racing support several local organizations. We want the money you pay for this race to stay in the local community and help some great organizations. Showers to rinse off the mud? You bet, and plenty of them. Don’t forget to bring a towel and a change of shoes! Choose a 5k or unlimited laps that include 20+ obstacles and tons of mud. Kids as young as 7 can race the full 5k course too! It's fine to race solo, but more fun as a team! After checking out you can choose to race on a team or race solo. You can create a team or enter a team code to join someone else's team. Make sure to have 5 teammates three days before the race and each teammate will get a gift certificate on race day. There's no limit to how many teammates you have, we even have an award for the largest team! Please see our obstacle course race discount & promotion page for all the latest discounts, promos, promotions, discount codes, and coupon codes for Lake Erie Pennsylvania Terrain Racing Mud Run 2019. There also may be one listed at the top of this page.